A bright film about a man who’s life is turned around by a drug that could kill him – Limitless is one in a growing line of films to look at what we could do if we could use 100% of our mind. Limitless follows Eddie Morra (Cooper), a failing writer whose life starts to fall apart. His book is overdue, his girlfriend leaves him and his landlord is on the verge of kicking him onto the streets. He then bumps into his ex-brother-in-law on the street, who is marketing a brand new drug yet to hit the market called NZT. NZT supposedly allows the taker to use 100% of his mental capacity, so when Eddie takes it he is a changed man, accomplishing things he could only dream of at lightning speeds. However the powerful drug has side affects, and his actions drag him into a dangerous world. Funnily enough, this wasn’t the last time Bradley Cooper played a failing writer! Read our review of The Words here. I feel like the idea of unlocking the potential of the human mind is something that has been looked into by Hollywood more than science itself! 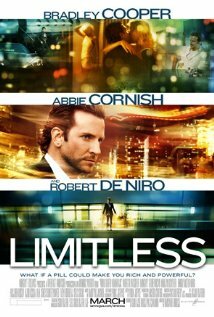 But out of all the films I’ve seen that look at this idea, I think Limitless is the most believable. The idea that someone can take something that makes them increase focus exponentially, and also be able to recall everything they’ve seen or heard before and use it, strangely doesn’t seem as impossible as, say, being able to change your appearance. I also like the way that Limitless almost becomes a race to the top of the tree as Morra starts working for businessman Carl Van Loon (De Niro) while at the same time a race for survival between Morra and Gennady (Howard) – two different dimensions to the story, led by a character with a secret to hide yet exploit. In other words, plenty to get into! Comparison’s are immediately drawn between this and the more recent Lucy, see how she uses 100% of her brain in our review here. I know it’s not quite the same, but Transcendence (Johnny Depp) also looks at somebody being able to open up the world and access everything. Read that review here. Bradly Cooper’s performance in this film is easily overlooked as it is not too different from what we’ve already seen from him, but there are little bits of this performance that remind you why he is one of the top actors going. The way he talks under NZT and also how he narrates over himself explaining what he’s feeling is spoken with such speed and confidence, it almost sounds as if he’s about to trip up on his next word. One flinch or microscopic pause and the moments gone – the amount of effort (to remember the lines fluently) and skill he must have put into those situations deserves to be mentioned and applauded. Also how he acts when Eddie is panicked or under pressure is very solid, however I’m not 100 percent sold on his crying! Much like Cooper, there is nobody that really performs exceptionally, or at least better than expected. However I was very impressed by Andrew Howard, who plays the loan shark turned NZT competitor to Eddie Morra, although that’s probably down to how the character Gennady turns from thug to intellect as much as his acting! Neil Burgers directing in this film is quite different, and I think on the whole, it is pretty good. The majority of the film is shot very crisply and clearly and is visually exciting to look at. However some of the camera movements are quite odd. I must say that the way Burger shows NZT giving the taker peripheral vision is exceptional and puts you right in the mind-set of the individual – the thing that gets me is the ‘zooming in/through’ shot. It appears at the start and while Morra ‘skips’ time at stages in the film, and while it’s again showing what he is seeing and putting you in his head, it’s not comfortable to watch and almost feels old, which goes against the fresh and modern feel of the rest of the film. This is a film that I must have watched at least three times now, and there’s always something that draws me back to it. I think it’s the clear, crisp, modern feel of the shots that is the ultimate selling point for this film. All in all a very good looking, intelligent, engaging film that is definitely worth a watch! Ever fancied writing reviews with us?